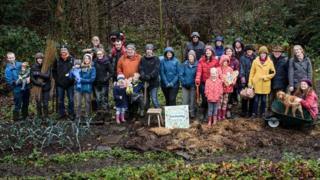 Community gardeners are opposing plans which could see their plot taken over by a developer in Denbighshire. Llangollen Community Garden was set up on a half-acre site owned by the county council in 2012. A developer has approached the authority to take it over with the offer of an alternative plot for gardeners. But they have said they want to stay put having worked hard to make the site produce vegetables, fruit and flowers. The council said a final decision was yet to be taken and it was trying to work with the gardeners. About 75 have worked the site since it opened along with over 100 school children. One of the gardeners, Warren Davies, said: "We have put so much work into this project, an investment of thousands of hours of volunteer work. "We have worked hard to create a community resource which is open to all, at no cost to the council, but it seems the council is willing to destroy that." Denbighshire council said it continued to engage with the gardeners although the offer of an alternative location for the community garden had been rejected. A spokesman said the authority's asset management group was due to meet in January to review plans before deciding "whether to progress with the proposed exchange or follow a different course of action".